A hall commemorates those from the parish who served in World War One. The foundation stone of the hall was laid by the Bishop of the Diocese, Dr Stephen on the 27th February 1924. 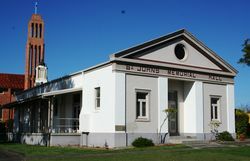 The splendid Sunday School Hall which has been erected in the grounds of St. John's Church, Taree as a memorial to those who enlisted from this parish was officially opened by Canon Phillips on Tuesday afternoon. It only seems a few weeks ago that his Lordship the Bishop of Newcastle laid the foundation stone and now the building is ready for use. Built of white brick, with a nicely tuck pointed front, the hall presents a most imposing appearance. On the front the words: "St. John's Memorial Hall" are picked out. Entrance to the main hall is gained through a porch on each side of which is an ante-room. In this porch suitable memorial tablets will be erected in place of the honor roll which at present hangs there. The interior of the hall is nicely finished off. At the opposite end to the main entrance is a spacious stage. A large room at the back, which is provided with sinks and other facilities for social functions, is shut off from the stage by sliding doors. There are plenty of windows and doors. A handsome lattice ceiling adds the finishing touch to a neatly designed and faithfully constructed building. Mr. H.E. Carrutt was the constructor; and Mr. H. W. Hule architect. The cost of the building was £1500. After the opening, Mrs. Newton presented a flag which was unfurled by Mrs. R.H. Phillips. A successful concert was held at night.